I have to make this quick and easy for you guys to win this event. I'm late (AGAIN) already for posting this. Thanks to my ISP, I was not able to access my blogger blog for hours! 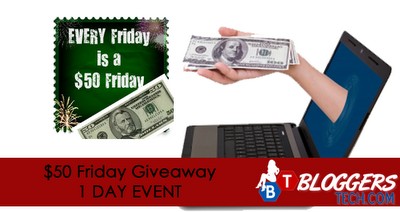 Now, for the giveaway you have to FOLLOW EVERY SINGLE BLOG on Twitter so that you can WIN $50 today! Also, kindly please state BLOGGERS TECH as a blog where you joined this giveaway, as for the mandatory entry. This giveaway is open 24 hours, so join now, don't do it tomorrow when you can join today! If you don't have a Twitter account then don't worry, come back NEXT week for our Facebook event or go on and have yourself a Twitter account. Fill out the form below with your REAL accounts and information, so that we could verify and contact you easily if you get to win! Thank you for all your support and keeping up to date here in Bloggers Tech! Mwahlovz!